If AHTD does go for the five lane option, how much more will it cost in the end if the corridor ends up being upgraded to interstate standards later, or ends up requiring other improvements due to safety issues and/or development issues? Though I haven't been though Arkansas in years, nor recall having been on a longer distance, rural five-lane highway in Arkansas, I would expect such a facility to run into issues a surplus of driveways and left turning crashes. IMHO, AHTD should at least go for a four lane divided option, so if further upgrades are required they won't be as costly. Is it a 4 lane undivided with a center turn lane? Yeah, that's what they mean when they say 5 lane. I just looked at streetview. It looks to me like it should cost less than half the cost of an interstate. There is already a good road there and not having the cost of over passes, interchanges .land and so on should save a lot. It really doesn't look like they even need a continuous turn lane . It looks like intersections would be fine . How many vpd is this road? They may upgrade 67 to 5 lanes for now, but I-30 will eventually be built on a new location as a full freeway. I know that this may be a little off topic, but on 226, they are now building a bridge that is about 10 feet above the ground parallel to the road, two lane right now, but other two should be built when others are done. $37.8 million for 3 miles of EXTREMEMLY flat road better be more than 2 more lanes. Needs to be 12 miles longer, too. I-30 will eventually be built on a new location as a full freeway. Corning Mayor Dewayne Phelan and NEARIFA board member Dalton Sullivan discussed a recent planning meeting of several members of the Hwy. 67 Coalition. At that meeting it was agreed the coalition, as a whole, would endorse: a) a four-lane facility from the end of the four-lane in Missouri to the end of the four-lane in Arkansas; b) the westernmost four-lane alignment and c) an expressway facility that could be converted to interstate standards. This resolution, which will be discussed and voted on when the complete Hwy. 67 Coalition meets in Walnut Ridge on Friday, Oct. 25, is significant because it reflects a compromise between leaders in Clay and Randolph Counties. Officials in Clay County have in the past preferred that the Arkansas Highway and Transportation Department (AHTD) continue with Highway 67 north from Walnut Ridge to the state line and be built to interstate standards and follow Arkansas highways 34 and 90. Randolph County and Pocahontas leaders opposed this idea because if built, Highway 67 would then bypass Pocahontas completely. With the proposed resolution, the Hwy. 67 Coalition is endorsing the western-most route, which will bring the highway much closer to Pocahontas. They also hope the AHTD will see the unity between the three counties and communities, and react favorably to expediting work on Highway 67 north. The AHTD standard and the cheap way out... Lay out a big bed for asphalt... then let development pop up. Apparently this area floods frequently. Some older news mentioning flooding on Highway 226. I've seen this kind of construction in Poland as well, where they have some low-lying areas that flood every spring. it was agreed the coalition, as a whole, would endorse: a) a four-lane facility from the end of the four-lane in Missouri to the end of the four-lane in Arkansas; b) the westernmost four-lane alignment and c) an expressway facility that could be converted to interstate standards. The proposal acknowledged that the highway improvements north of the Missouri state line would not be to interstate standards and suggested making the same decision on the Arkansas side to be able to connect at the Missouri line quicker. Representatives of both the Arkansas and Missouri transportation departments also spoke briefly to those gathered. Jessie Jones with the AHTD Planning Division reported that they are hoping for a decision on the route in the spring. "I really appreciate this," she said, referring to the proposal. "This comes in handy to be incorporated in the study." It will be interesting to see if AHTD will abandon the notion of a future upgrade to interstate grade as part of the planning process. Will Future I-30 end at Walnut Ridge and have some sort of tie-in with I-555 in Jonesboro (AR 226/Future I-730)? With this new development, I don't see an interstate designation coming anytime soon for the US 67 corridor. I am afraid that once the new "expressway" is built that it will become a commercial strip and any future freeway upgrades will require a bypass of the improved segments. I certainly hope that it isn't built as a five lane facility. The five lane configuration definitely brings up some doubts about what will happen to the US-67 corridor in the long term. However, it would still be possible to convert a road into an Interstate facility if the road and its surroundings are designed and zoned properly. A five lane road made of concrete wouldn't necessarily be any different in width than narrow Interstate highways like much of I-44 in Oklahoma or parts of the Pennsylvania Turnpike. With an Interstate conversion the middle left turn lane would have a Jersey barrier or cable barrier installed down the middle of it separating both directions of traffic. That middle lane would turn into a pair of interior left shoulders on the highway. The right of way is the real deal maker or breaker in regard to future upgrades to Interstate standards. The highway would need enough right of way and zoning enforcement to keep any new businesses from being built too close to the road. With a far enough set-back enforced there might be enough room to built future on/off ramps, service roads, etc. in commercially developed areas. IMHO, AHTD should take a Texas style approach. Build a divided four lane facility with enough room in the median for a future superhighway. Then they wouldn't have to worry about new homes and businesses encroaching the space reserved for a highway upgrade. An Interstate designation could be a long shot in any scenario with the upgrades Missouri DOT has to make to US-67 up to Poplar Bluff and US-60 over to Sikeston at the interchange of US-60, I-55 & I-57. They're talking about widening US 67 into 5 lanes, not building a 5 lane highway on new location (which would be stupid). I still say that I-30 gets completed one day, but perhaps not in our lifetimes. Let me get this straight, After all these years of slowly extending 67 with interstate standards from Little Rock to Walnut Ridge and from Sikeston to Poplar Bluff, both states now decide to stop? Right when they are about to finish it? The last segments are all that's left. Why would they not just go ahead and finish the job? Dickens Valley residents who live along F Highway northwest of Ellington will likely be overjoyed to hear the results of the most recent program priority selections of the Ozark Foothills Regional Planning Commission’s (OFRPC) Transportation Advisory Committee (TAC). The second priority chosen by the committee was the four-laning of U.S. Highway 67 from just south of Poplar Bluff to the Arkansas state line. Maybe MoDOT and AHTD will design their expressways to accommodate relatively efficient future conversion to an interstate-grade facility (if AHTD can resist the temptation to go the five-lane route on their last section). 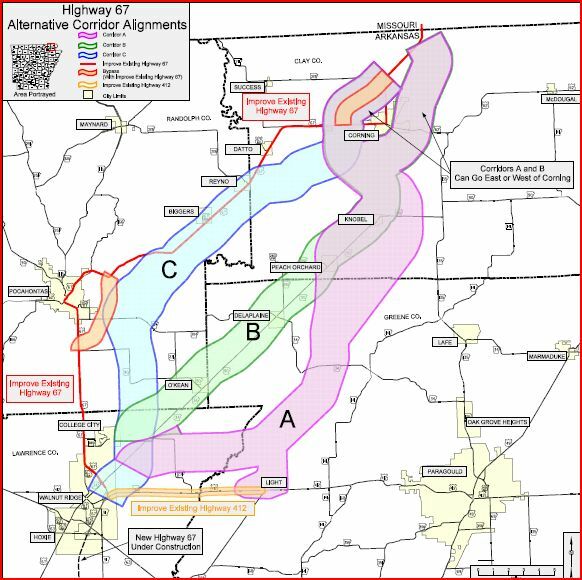 AHTD, would you be able to post a link to a copy of the proposal that the Highway 67 Coalition sent to AHTD and Gov. Beebe? I'm particularly interested as to whether the initial preference for "an expressway facility that could be converted to interstate standards" survived as part of the proposal. Will be glad to look into that for you! Can you be more specific about the report in which you are seeking? Is it the "Close the Gap" report? "We are here to make an announcement of an agreement among the key players in the three counties," said Walnut Ridge Mayor Don House, who led the meeting. Above said, if the "Close the Gap" report is different than the proposal, then I would also like to see that report. 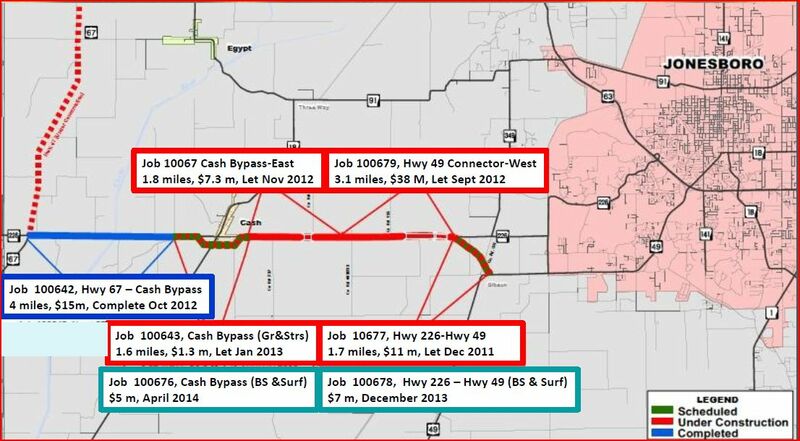 Work is underway on Highway 67 from the interchange with Highway 226 (between Swifton and Cash), northward to the Highway 63 interchange at Hoxie. McMillan said there are four different construction projects underway on the six-mile stretch from Highway 226 north to Highway 230. Work has also begun on the 10-mile stretch from Highway 230 to Highway 63. Much of the grading and structure work is completed and the paving contract will be let in December. "If things go really well, in another two to two-and-a-half years we will probably be done with that section of 67," McMillan said. "It's coming; it's just a matter of finishing up." He did report that none of the final 16 miles will be opened until it is all complete, stating that Highway 230 would not be able to withstand the traffic if the first six miles were opened. "So, when the two open it will be all the way up to 63," he said. AHTD, assuming US 67 from I-40 to US 63 will be interstate-grade once the above projects are completed, does AHTD have any current plans to seek an interstate designation for that section upon completion of the projects, whether as an extension of I-30 or as an I-x40 spur? Have not been able to find anything related to the "Close the Gap" report but will post anything that comes along. Additionally, this minute order: http://www.arkansashighways.com/forums/Minute_Order_2012-025.pdf authorizes a study to re-evaluate long term improvement needs for the U.S. Highway 67 Corridor from Walnut Ridge to the Missouri state line. This is a planning study and we anticipate completing it this spring. The final product will discuss feasible alternatives but will not identify a preferred alternative. The latter will be carried out through the NEPA process.